Back in March, I parsed the declaration Nicholas Merrill submitted in his bid to reveal the contents of what he was asked to turn over via an NSL back in 2004. As a reminder, here’s what FBI permitted Merrill to reveal at the beginning of this suit. And here’s Merrill’s description of what kind of records his ISP, Calyx, might have had on customers. FBI has submitted a counter-declaration (posted by Cryptome) that — even in its excessively redacted form — includes a number of interesting details. The FBI now concedes that it had publicly confirmed some aspects of what it asked for from Merrill. 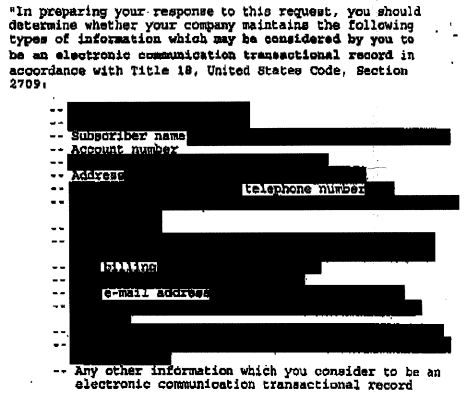 It specifically admits that “screen names or other online names associated with the account” and “all email addresses associated with the account” may be disclosed, as well as that the request involved an “account number” from an “Internet service provider” (though in the sections that must describe these requests, those phrases remain redacted). Interestingly, the declaration makes clear the NSL — which was almost certainly authorized as a terrorism investigation — was authorized in Pittsburgh. I raise that because Pittsburgh’s FBI office was investigating a number of anti-war targets as terrorists in the 2004-timeframe. So I do wonder whether Merrill thought the investigation improper for that reason. As I’ve noted, we know some production obtained until 2009 using NSLs has moved under Section 215. This paragraph seems to acknowledge that, even while saying the FBI may ignore what the Office of Legal Counsel has told it ECPA permits FBI to obtain using an NSL. Curiously, this pertains only to the second bullet of the request (above), of 17 categories of information, suggesting just one kind of production moved to Section 215 orders. The FBI has a separate paragraph addressing why it cannot reveal the other 15 categories of information it requested from Merrill 11 years ago. The paragraphs are worth reading, because they’re each somewhat different. Some say not just counterterrorism and counterintelligence investigations might be affected with the release of the information, some claim greater use than others, some warn that potential criminals might avoid turning over certain kinds of information (perhaps an alternate email or phone number?) if they knew it could be obtained via an NSL. All seem to pretend that a lot of this isn’t already available from exhibits submitted in other cases. As I noted in this post, for example, here’s what the government obtains from Google subpoenaing a Google voice account and then the underlying Google account as a whole. There’s surely a significant overlap between this list and the things FBI says Merrill can’t reveal because if he did, it would tip off intelligence and criminal targets that the FBI can obtain them (though as Merrill made clear in his description of what Calyx had to turn over, they had more details about the websites run under an account). Ultimately, though, the FBI seems to want to prevent anyone from realizing how much information your Internet providers have — and can be forced to turn over — that correlate all your multiple identities online. One would think that they would reveal all these categories of information going forward if they were really going to comply with ODNI’s order. Unless the FBI has already started to change the way they write NSLs (or perhaps plan on leaving more to verbal communications with Agents or some other means of communicating the list without including these descriptions) so as to get all the information without stating that they’re demanding all that information. deep appreciation to emptywheel for her outstanding work in revealing the snags and sandbars of the various devious and deviously named spying-on-americans legislations and fbi-nsa-doj practices. too bad the senators will now tuck their tails between their legs and unanimously vote for the deviously named, with yet more devious practices, USA freedom bill. this vote, of course, for no other nationsl exigency than to protect themselves from attack in the next election cycle they experience.